Gebhart grew up in the Pacific Northwest, in an artistic and creative family who filled his young years with experiences of art and music. In 1967, he came to the Cleveland Institute of Music to study harp, but a part time job at the Cleveland Museum of Natural History opened his eyes to the natural world and led to a career of exhibit design and illustration. Gebhart sailed to the Dominican Republic in 1980 where he built a small museum. In Arizona he built and opened a painting studio while also crisscrossing the country to work on other projects. 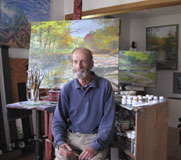 By 2008, he had settled into a farmhouse in Windsor, Oh, and opened a studio where he has been painting scenes from around Ashtabula County, among his many other projects which include working on historic exhibit panels for the Windsor Historical Society.